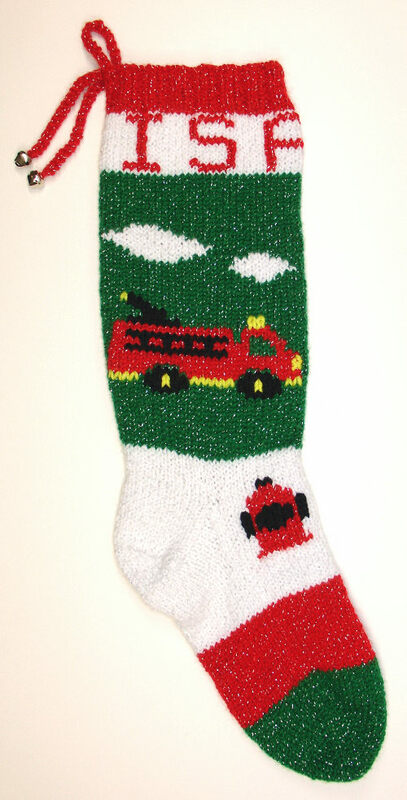 Here are examples of custom Christmas stockings that I've knit with toy pictures on them. There are so many possibilities here that it's impossible to list them all! Several small toys or one large one would both be good options. Many toys can be done in classic colors, or a wide variety of colors can add interest. Please look to see what Customers Say about stockings I've knit with toy pictures. I love the detail and the child-like sense of magic in this sweet teddy bear design. The colors are beautiful as well. It takes 3 views to see all of this beautifully detailed old design. Any of these toys could be "borrowed" and used on another stocking. The ball and drum are particularly nice. This is the only place I've ever seen a rabbit toy . I don't recall seeing this sort of angled name banner in any other stocking pattern, other than the set that contains this design. This stocking was created for a firefighter. The green, red, and white yarns are all wrapped with a thin silver thread, so the whole stocking sparkles! The miniature Christmas stockings below the reindeer add a touch of color. It's hard to find really tiny pictures that work well, so I was delighted with how well this little teddy bear turned out. One of a pair of complementary designs, this stocking has an elegant Christmas ornament and a teddy bear sitting under a snowflake garland. The unusual colors were chosen by the customer to harmonize with her decor. These small pictures were borrowed from a couple of different patterns and put together for a new look. This beautiful design was created to complement the other family stockings. The main picture was different on each, while the border-style patterns varied somewhat. This unique stocking reflects the interests of its recipient. The design worked well with traditional colors. The bicycle is surprisingly detailed for its small size. The classic sailboat silhouette would work well on many knit items. This is a great design for a boy of any age. The smoke puffs and track add some depth and character without making the design too busy. For a smaller stocking, I modified the design so that the basic look was similar, but it wasn't as wide. The use of yellow for the tracks, wheels, and other accents is unusual but really works well. A very cheerful design in bright colors was a special request for a customer's grandson. The train is similar to the previous ones, but adjusted slightly to fit. A classic 3-stripe design, with pictures chosen for the customer's grandson. This train is different from the ones above. The top border of drums was borrowed from the rocking horse stocking. The tiny train travels all the way around the stocking. This detailed stocking was considerably harder to knit than most, but the result is well worth it. That's a row of drums between the rocking horse and the train. If you're interested in a stocking with toy pictures, find out more about ordering custom Christmas stockings.